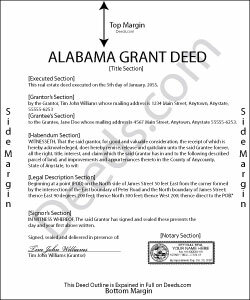 A grant deed, as a type of conveyance used in Alabama, is required to be in writing, and must be signed by the grantor. The execution of a grant deed should be attested by at least one witness, and if the party cannot write, by two witnesses who are able to write. However, a proper acknowledgment can take the place of witnesses (35-4-20). Grant deeds are not mentioned by name in the Alabama statutes, but the deed is still in common practice in the state. A grant deed transfers property ownership from a grantor or entity to a grantee or entity. In this type of deed, the grantor promises that he/she has not transferred the title previously and that there are not any encumbrances, other than those that may be stated in the deed. In addition, a grant deed will pass after-acquired title. A grant deed is inoperative and void as to purchasers for a valuable consideration, mortgagees, and judgment creditors without notice, unless the instrument has been recorded before the accumulation of the rights of such purchasers, mortgagees, or judgment creditors (35-4-90). Grant deeds are recorded in the office of the judge of probate in the county where the property is located. Recording serves as constructive notice of the contents of the deed.